"World Class IT Consulting & Virtualization Services for Global 500 Public & Private Organizations"
CNC's again partners with SAIC to provide strategic technological leadership to Pfizer! (January 11, 2007) Norm Hebert, CNC's Lead Virtualization Architect, announced today that he has completed his second (ten month) engagement at Pfizer, Inc, under a subcontract to SAIC. One of Mr. Hebert's primary responsibilities was the preparation and delivery of a comprehensive "gap analysis" assessment of Pfizer's entire existing ESX 2.5.x virtual infrastructure for Pfizer's CIT (Corporate Information Technology) division. In this deliverable, Mr. Hebert made many recommendations for the improvement of existing Virtual Infrastructure operations as well as many proposals for design enhancements for the upcoming (VI-3 based) 'Next Generation Architecture". Mr. Hebert also served as the "VMware Capacity Manager" for the BTE-SI (Business Technology Engineering- Shared Infrastructure) project and also fulfilled the role of "BTE-SME (Subject Matter Expert)" for the AtS-ViP (Adapt-to-Scale Virtualization-in-Place) effort. CNC much appreciated the opportunity to partner with both SAIC and Pfizer for the second time and looks forward to many more such engagements in the upcoming years. CNC delivers in short order for Advance Auto Parts! Norm Hebert boots a node of the HP DL585 based ESX farm designed & delivered to Advance Auto Parts. (February 27, 2006) CNC announced today that it has completed an intensive and compressed 10 week, virtual architecture design, implementation and migration project for Advance Auto Parts of Roanoke VA. AAP is the second largest auto parts distributor in North America and is rated #477 on the 2006 edition of the Fortune 500 survey. The project included a quick assessment of the existing AAP virtual infrastructure, a total redesign using upgraded/redundant components together with a new, dual-tier SAN architecture (utilizing an IBM ESS 800 w/ FC arrays for Tier 1 and IBM DS4300 w/ SATA arrays for Tier 2 storage). A "shell game" based "rolling upgrade" was then performed, migrating "one ESX server's worth" of production level VM's out of the old environment and into the new, such that the old server hardware could then be reused into the new environment, thus requiring that only one new "seed server" needed to be procured (for use as the "anchor server" of the new environment). CNC's Lead Architect completes 6 month consulting engagement with the world's largest chemical company! (August 31, 2005) Norm Hebert, CNC's Lead Virtualization Architect, today completed a six month assignment (on behalf of IBM Global Services) having been detailed to the Dow Chemical Company of Midland Michigan. The Dow Chemical effort was an Enterprise Transformation project for the world's largest chemical company with a scope of over 3,150 Intel servers worldwide. Mr. Hebert's duties included: design of the new Reference Architecture for all virtualization services, TCO/ROI analysis for the new Target Architecture, design and deployment of a multi-server virtualized Application Hosting platform, together with an application profiling and rationalization effort to strategize migration of existing applications into the new environment. Mr. Hebert very much enjoyed working with all the good people on the Dow Chemical account and wishes the entire team much "Happy Virtualizing" ahead. CNC completes Intel/x86 "Phase I" Server Consolidation Assessment for VNU/AC Nielsen! (March 7, 2005) CNC is pleased to announce that once again it has teamed with IBM Global Services and delivered a "Phase I" Worldwide IT Optimization/Server Consolidation Assessment for VNU/AC Nielsen of Schaumburg IL. CNC, as subcontractor to IGS, was responsible for accessing the consolidation/virtualization opportunities for all 1,400 of AC Nielsen's Intel/x86 servers deployed across 66 disparate locations (700 in North America and 700 in their EU/AP regions). CNC also delivered a High Level Design (HLD) for the proposed "optimized virtual infrastructure". CNC very much enjoyed working with all the good folks at IBM/ITS and VNU/AC Nielsen and feels that it gained valuable international insight and expertise working through the legal and regulatory implications of migrating/consolidating servers across European Union borders. (update: May 25, 2005) CNC has been informed this day that, based upon it's proposed HLD, IBM Global Services has been awarded the contract to undertake the Detail Design for VNU/AC Nielsen's virtualization/consolidation efforts. Best of Luck to IBM and VNU/AC Nielsen! CNC partners with SAIC and delivers four highly scalable Virtual Center Farm Complex designs to Pfizer! (December 20, 2004) The management of CNC this day reports that, in cooperation with Science Applications International Corp. (www.Saic.com), it has completed a four month project and successfully delivered four highly scalable VMware Virtual Center Farm Complex designs to Pfizer Corporation (www.Pfizer.com). Each of these Farm Complexes host eight Virtual Center farms which in are comprised of eight ESX servers each and are based upon Hewlett-Packard p-Class Blade Chassis populated with BL45p (quad-processor Opteron) Blades. 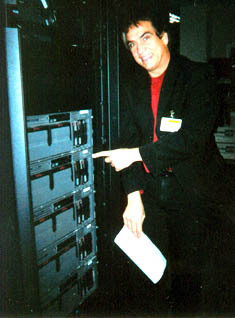 These 32 Blade, 128 CPU, VMotion enabled complexes were then "home runned" directly into EMC Clariion-700 Storage Subsystems and, unified together as designed by CNC, they delivered a "1,024 VM, scalable unit of virtual infrastructure" which can be purchased in quantity and standardized across the Pfizer Enterprise. As a bonus, with just slight LUN masking modifications, each blade in the complex can alternately be configured to run any "traditional" x86 OS, including the new 64-bit versions of Windows Server 2003, Red Hat Enterprise Linux 3 and Sun Solaris 10. Flexible, scalable and adaptive. HP, Pfizer and CNC! Norm Hebert chosen by IBM Global Services! (August 23, 2004) IBM Global Services (IBM Global) announced today that it has recruited Norm Hebert, CNC's Chief Windows Virtualization Architect, to assist them in a migration/virtualization effort on behalf of the International Netherlands Group (ING). The project involves the migration and virtualization of several dozen MS Windows servers out of ING's El Segundo and Torrance California business offices and into the IBM-West Data Center in Boulder Colorado. 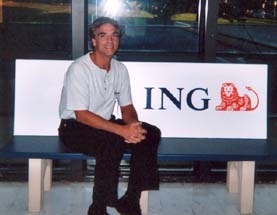 Mr. Hebert looks forward to a long and successful relationship with both IBM and ING. CNC awarded GSA Multiple Award Schedule to supply IT Services to the US Government! (August 9, 2004) The US General Services Administration announced this day that it has awarded CNC with a five year contract which will enable CNC to supply IT Services to hundreds of US Governmental agencies worldwide. The granting of this GSA Schedule was the result of an intensive 18 month effort by the management of CNC, after having supplied training and consulting services to a number of Federal Agencies over the past few years (Past Government Customers). CNC looks forward to expanding our portfolio of satisfied Government customers in the years ahead and wishes to thank the helpful staff of the GSA for all their efforts to bring us "onboard". © 2002-2005 Certified Network Consultants, LLC.